At Western Digital every drive is engineered to have a purpose. Since 1970 Western Digital has been one of the world-wide leaders in storage hard drive and external storage technology. Today they have evolved to be the global leader in specialized storage technologies such as internal storage, external drives, and storage arrays. Format: ExFAT format for Windows 10 Windows 8, Windows 7, Mac OS el Capitan, Mac OS Yosemite, Mac OS Mavericks, Mac OS Mountain Lion, DLNA/UPnP or Plex enabled streaming devices. Aventis Systems is proud to deliver all of our WD My Passport Wireless Pro drives with a standard 1 year hardware support warranty with upgrades available to Extended terms, Express next day parts replacement, and Secure Drive hard drive retention warranties. 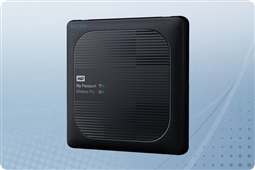 So shop our models below and buy the best in photo and video backup today with the Western Digital My Passport Wireless Pro from Aventis Systems!